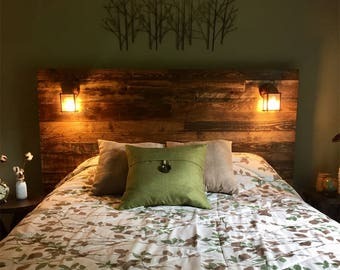 Pallet Wood Headboard - Rustic/Industrial - Repurpose, Reuse, Recycle. Each one is unique! GRAY & WHITE Weathered Finish! NEW!! Painted gray with a white wash finish! Get the look of dried, sun-bleached wood look but have it done so on solid, structurally sound boards! Great for a country, industrial, or coastal/beach theme. 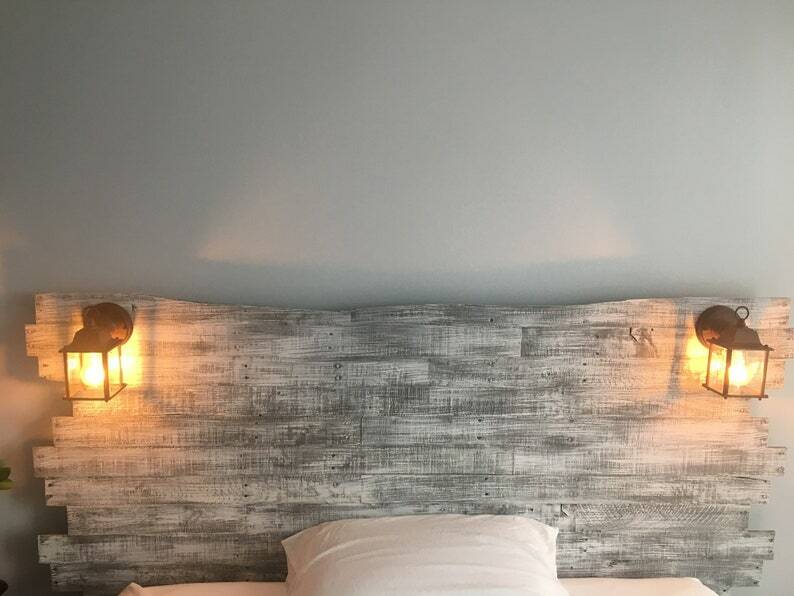 These are hand-made headboards built using reclaimed pallet wood. I design and build each one individually and the layout of each is completely different. No two are the same! I also sort through the lumber to look for boards that noticeably have a lot of character. Knots, holes, bark, rot, etc that make each piece special. I leave nail heads in the wood and any stamping/writing as well. Lots of character. With all of this being said, your headboard will not look exactly like any of the ones pictures, obviously. These are just examples of ones that I have created and yours would be SIMILAR. Headboards are sanded and triple coated with a polyacrylic. The back side of the headboards are unfinished. They are designed to have the legs be mounted to a standard metal bed frame. SIZE: **Choose At Checkout** Use the dropdown menu to choose your bed size. LAMPS: **Choose At Checkout** Use the dropdown to choose with or without lamps. Lamps now have pull-chain switches, they DO NOT have wall switches as seen in the photos above. FINISH: These gray & white headboards have a four step painting process. They are mostly gray with a white dry brushed finish. You can have them be more white, or more gray to suit your preference, just let me know in the "notes" section of your order when you check out. They are then finished with three coats of polyacrylic. !!NOTICE!! Some assembly is required. The headboard will arrive in 4 or 5 large pieces and will require screws to be driven into the back of the piece. A screw gun or drill with philips bits are highly recommended. All instructions and hardware will be provided. SHIPPING: I DO NOT SHIP OUTSIDE OF THE USA. We are amazed by Adam and the quality of his work. His passion for what he does shows in his work. My son is so happy with his handcrafted headboard. Awesome! Like other reviews have said, be prepared to wait a pretty long time. I think I received my headboard about 3 months after purchasing it. That being said, the headboard is absolutely gorgeous and very well made. It was easy to assemble (took us about 10 minutes with a power drill/driver). If you’re looking for a beautiful wood headboard, I would recommend buying from this shop. The seller is very communicative and friendly; I received regular updates and help picking out the stain I wanted. This piece is beyond amazing and exactly what I was looking for! Due to the intricate work Adam does, it takes some time before it is delivered but it is beyond worth it! This headboard is awesome! Adam was so great to work with. He responded immediately to all of my questions. If you’re looking for something handmade and truly unique, this is the headboard for you. Detailed assembly instructions and all of Adam’s markings made it very easy to assemble. You can tell that he takes passion in what he does and it shows in his designs.